Beautiful Oceanfront home on the very south end of Wrightsville Beach. 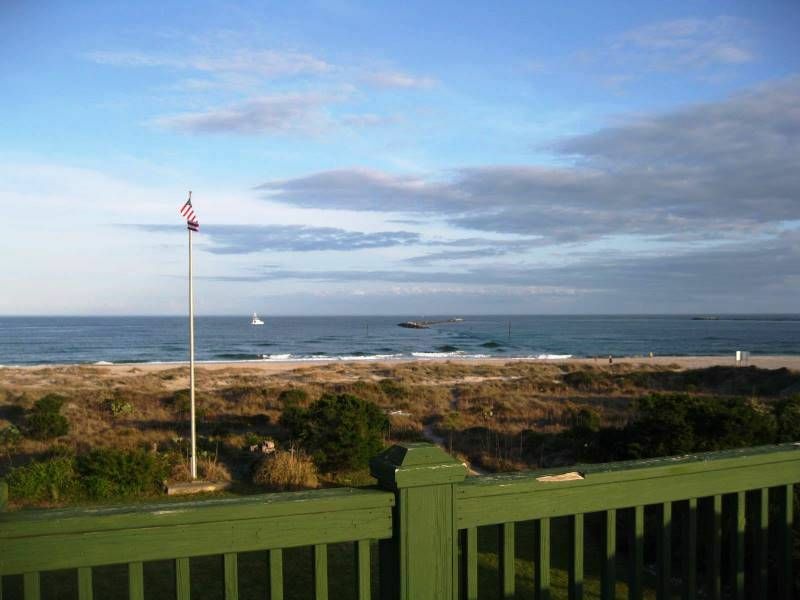 The house has lots of porches & decks with breath taking views! Step off the porch and you are just a few feet from the beach. The house has 3 bedrooms a loft and 2 full bathrooms. You will not be disappointed! Summer rentals are WEEKLY ONLY!! Saturday to Saturday!! Thanks!! Our huge porches have rocking chairs and a swing and there is an upper deck with fantastic views and also has an old picnic table for sunset drinks or appetizers. We are at the far south end of Wrightsville Beach (5th house) Ocean side of course! The master bedroom has a queen and the middle bedroom as well. These 2 bedrooms share a full bath. The back bedroom has 2 twins and has the steps to the loft which has a queen and a twin. There is a full bathroom back there too, but no tub... just a shower. Our place has a very friendly atmosphere and you will probably see a family member or 2 walking to the beach or surfing. It’s not as crowded down here due to limited parking and we have a really good beach. We also have our own path (as you will see in the pictures). We spent thanksgiving weekend and had a great time. Even if the weather is bad you can enjoy the ocean views from the comfort of the living room. Fortunately we had some great weather days too and had direct access to the beach and great shelling. The beds were comfortable and the kitchen had everything we needed, although pans were a bit worn, likely from guests using metal utensils instead of nylon. Would definitely stay there again! Loved sitting on the deck and enjoying the view. Short walk to the beach.Great. We visited for a week prior to dropping our daughter at school. Two families, 7 people. The house was great, just as described. Owners were around but not intrusive and we passed other tenants here and there but never any problems. The kitchen was well stocked with any cooking items we needed, beds were comfortable, and the house was clean. Bathroom showers and tubs need a little TLC, but absolutely manageable and in good working condition. We would absolutely return to this property. Thank you Taber family for a great stay ! Ps. Loved the rooftop deck for happy hours ! Perfect location at the beach! Far enough away for quiet and close enough to town for dinner! Loved the location. It was perfect for our family get together. Right on the beach for surfing, kayaking and paddle boarding. Easy walk to the Oceanic for dinner or drinks. Lots of areas to hang out either in the yard or deck. Fire pit there as well. We had a great time and had everything we needed! . I took my husband to the home for a short winter stay for his birthday. What a beautiful place! The home is in the perfect location at the end of the beach, ocean front and there is a beautiful rock pier and inlet next to it. Such solitude and beauty in February. We watched the parasailers and surfers from the lovely deck. The home is very clean and spacious, a real treat. There is a fire pit area outside too for those cooler nights. We had an amazing time. The host made the transaction super simple. We would love to come back for a longer stay.